While I sometimes lament the fact that my parents live so far away, I should also be thankful that really they’re only a three-hour drive, and are living in (arguably) the most beautiful part of the state. And, I can go visit them whenever I want. For instance, just the other weekend, as a combination Mother’s Day / Dad’s Birthday celebration, I made a visit. Even though the ostensibly spring weather was absolutely horrible, we made the best of it and went for a hike. 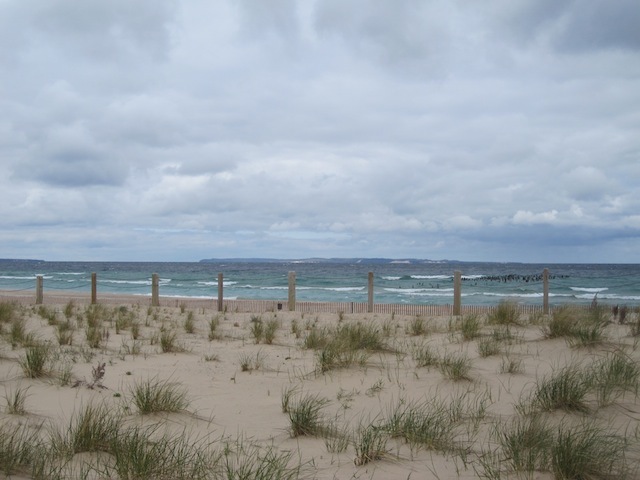 A mere 30-minute drive from their house is the Sleeping Bear Dunes National Lakeshore. 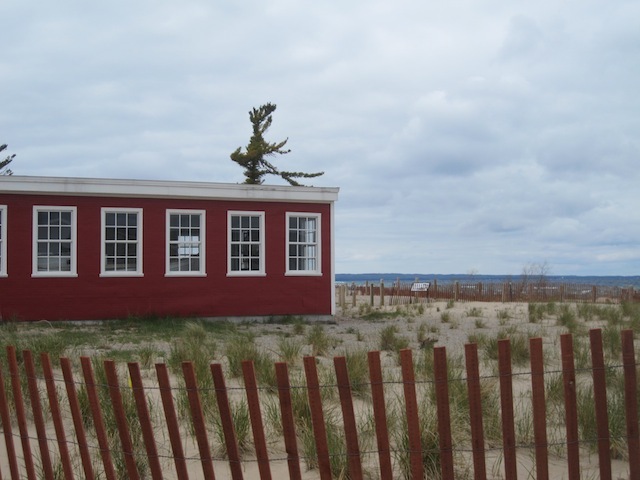 These pictures are from a wonderfully eery abandoned town called Glen Haven. (Perhaps I’ll provide a fascinating and lengthy history lesson on that later.) 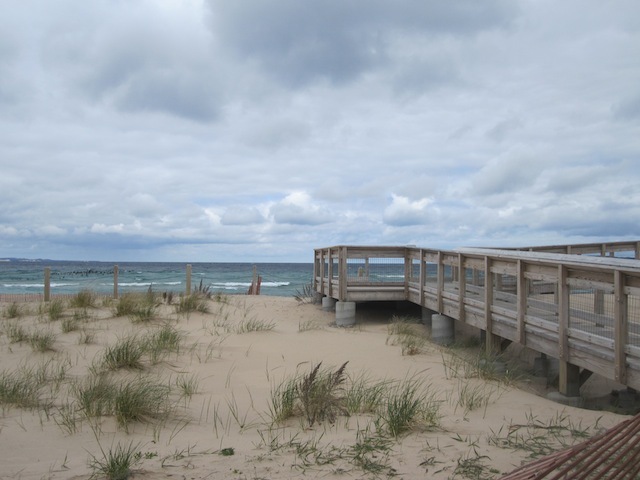 Now occupied by the National Lakeshore, Glen Haven has an amazing beach, a scattering of little old wooden buildings, and a trailhead or two. 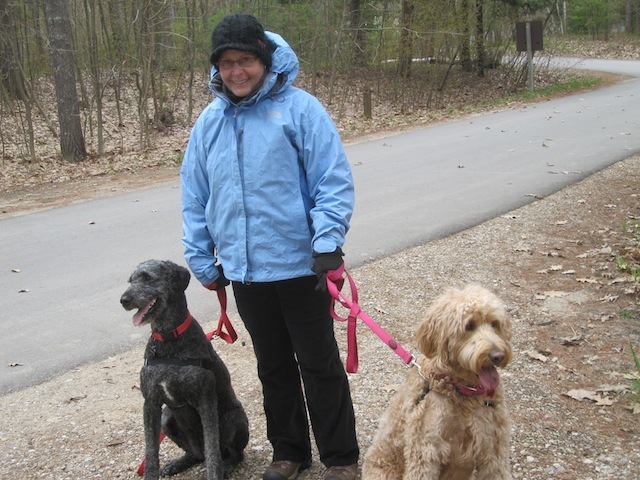 And of course I had to get a picture of my mom holding onto the dogs – Emma and Ruby, theirs and mine. (Please note the extensive garb my mother is wearing – yeah, that’s a winter ski coat, hat, and corduroys – in MAY!) Ah well, the dreary weather made for exceptionally moody pictures. When it’s 100 and humid I’ll look back on these and smirk. Why is this enrichment, you ask? I firmly believe anytime you can get off dead center and do a little exploring you are doing yourself a favor. You never know what you’re going to find outside the walls of your own space, especially if you keep your eyes open to it. So, while I have been to this general area before, I’d never walked on this trail, or been at the beach when the weather was quite so finicky. Standing alone on the sand as the cool wind pushes you around gives you a feeling of odd tranquility, and to me, that’s enrichment.